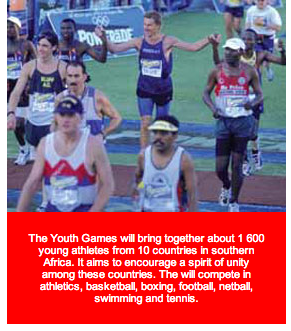 "Advancing Youth through Sport for a Better Africa and World" is the theme for the 2008 Zone VI Under-20 Youth Games. The games fall under the Supreme Council for Sport in Africa (SCSA). It will be held from 3 to 12 December in the North West province's Tlokwe Municipality. One of the main aims of the Zone VI Under-20 Games is to encourage a spirit of friendship among Africans. Participating countries are South Africa, Angola, Botswana, Lesotho, Malawi, Mozambique, Namibia, Swaziland, Zambia and Zimbabwe. The Games will bring together about 1 600 young athletes from these countries. They will participate in athletics, basketball, boxing, football, netball, swimming, tennis and athletics for the blind. The Games will play an important role in encouraging a spirit of friendship and unity among African countries. It will allow the young people of our continent to compete on the sports field and to socialise and learn about each other's cultures. The Games are developmental, which means they serve to develop young sporting talent. It will serve to prepare participating athletes to be more competitive for international sporting events. This will help the region to create a pool of talented athletes who can represent the region with pride at international events like the All Africa Games, the Commonwealth Games and the Olympic Games, as well as other international championship events. Hosting large sports events like the Zone VI Under-20 Games helps to grow interest in sport and to inspire the youth to participate in sport. The Games will also boost sport tourism to the region, which will benefit local businesses. The hosting of the Games is a partnership between Sport and Recreation South Africa (SRSA), the Supreme Council for Sport in Africa (SCSA) and the Tlokwe City Council, as well as the North West Government. Hosting the games will benefit Tlokwe and the region. 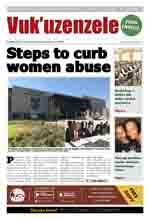 This is because of improved infrastructure and new equipment, as well as legacy programmes associated with the event. In addition, it will help to develop skills through the training of volunteers who will perform different tasks during the games. This, in turn, will empower them with work experience.